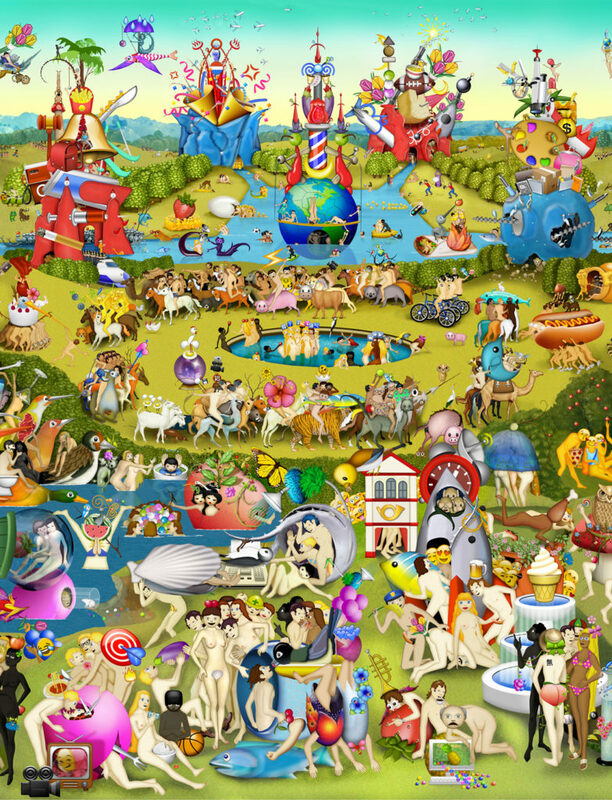 The large-scale (13ft x 7ft) print piece is an homage to Bosch, and deeply tied in scale and physicality to the original. The subsequent animations I have produced allow me to be more dynamic with this hybrid visual vocabulary, and I can play more (and at times critique more), across time, with the slippage of signifiers. Carla Gannis is a transmedia artist whose work examines the narrativity of 21st century representational technologies. She holds an MFA in painting from Boston University and is the recipient of several awards, including a 2005 New York Foundation for the Arts (NYFA) Grant in Computer Arts. She has exhibited in solo and group exhibitions both nationally and internationally. Features on her work have appeared in ARTnews, The Creators Project, The Huffington Post, Wired, Buzzfeed, FastCo,Hyperallergic, Art F City, Art Critical, The Wallstreet Journal, The New York Times and The LA Times, among others. She is Assistant Chair of The Department of Digital Arts at Pratt Institute, Brooklyn, NY.